On Friday, Amy and I said goodbye to one of the world’s greatest grandmothers. 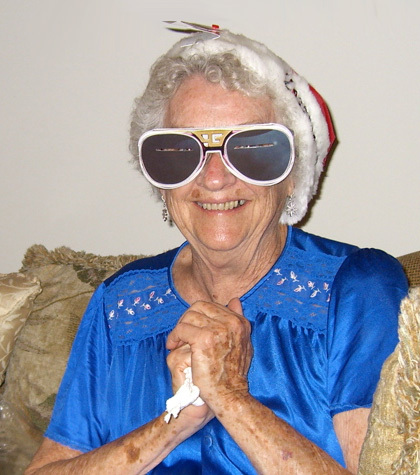 Cathleen “Maw Maw” Bishop was Amy’s mom’s mom and was an inspirational figure to both of us. Hearing that she had hours left to live, Amy wrote the following update on her Facebook wall. Quite possibly saying goodbye to the sweetest, bravest, most hilarious, amazing grandma a person could ask for. Her body is weak, but her will is strong and her spirit beautiful. I love you Maw Maw and I will cherish your memories. We drove down to Florida Friday afternoon but missed her passing by a couple hours. It was tough not getting to see her, but good to be there with the family. She was a mother to 8 children, loved listening to both Elvis and Engelbert and never missed an opportunity to cheer on her Tampa Bay Buccaneers. We’ll miss you Maw Maw. Hi my name is Nick Daws and I’m one of 277 that you convinced to follow you. I’m sorry to hear about Maw Maw. See seem like a wonderful person. I lost my mom 4 year ago and I still miss her every day. But our lives are better because special people like Maw Maw are a big part of it. Take care and my prays are with you. PS I own your book also. Love It. Hey Nick, Sorry my writing on here is so sporadic and personal. I didn’t really expect anyone to comment on this post but I’m glad you did. Thanks for the kind words and I’m glad you love the book.